"Kukui" redirects here. For the band, see Kukui (band). Aleurites moluccanus (or moluccana ), the candlenut, is a flowering tree in the spurge family, Euphorbiaceae, also known as candleberry, Indian walnut, kemiri, varnish tree, nuez de la India, buah keras, or kukui nut tree, and Kekuna tree. The nut is often used cooked in Indonesian and Malaysian cuisine, where it is called kemiri in Indonesian or buah keras in Malay. On the island of Java in Indonesia, it is used to make a thick sauce that is eaten with vegetables and rice. Outside of Southeast Asia, macadamia seeds are sometimes substituted for candlenuts when they are not available, as they have a similarly high oil content and texture when pounded. The flavor, however, is quite different, as the candlenut is much more bitter. At least one cultivar in Costa Rica has no bitterness, and an improvement program could likely produce an important food crop if nontoxic varieties can be selected and propagated. A Hawaiian condiment known as ʻ inamona is made from roasted kukui (candlenuts) mixed into a paste with salt. ʻInamona is a key ingredient in traditional Hawaiian poke. In ancient Hawaiʻi, kukui nuts were burned to provide light. The nuts were strung in a row on a palm leaf midrib, lit on one end, and burned one by one every 15 minutes or so. This led to their use as a measure of time. Hawaiians also extracted the oil from the nut and burned it in a stone oil lamp called a kukui hele po (light, darkness goes) with a wick made of kapa cloth. Modern cultivation is mostly for the oil. In plantations, each tree produces 30–80 kg (66–176 lb) of nuts, and the nuts yield 15 to 20% of their weight in oil. Most of the oil is used locally rather than figuring in international trade. In Uganda, the seed is referred to as kabakanjagala meaning "the king loves me"  and is traditionally used as an improvised toy to play a marbles game fondly called dool(oo). In Fiji this nut is called 'sikeci' and its oil is used in cosmetic products. In Maui, the kukui is a symbol of enlightenment, protection, and peace. It was said that Kamapuaʻa, the hog-man fertility demigod, could transform into a kukui tree. One of the legends told of Kamapuaʻa: one day, a man beat his wife to death and buried her beneath Kamapuaʻa while he was in tree form. ^ a b von,, Linné, Carl; Ludwig,, Willdenow, Karl (10 September 2018). "Caroli a Linné(1805); Species Plantarum Edn. 4, 4(1): 590". ^ "Aleurites moluccanus". Germplasm Resources Information Network (GRIN). Agricultural Research Service (ARS), United States Department of Agriculture (USDA). Retrieved 2009-11-15. ^ Razal, Ramon; Palijon, Armando (2009). Non-Wood Forest Products of the Philippines. Calamba City, Laguna: El Guapo Printing Press. p. 67. ISBN 978-971-579-058-1. ^ Blench, Roger (2004). "Fruits and arboriculture in the Indo-Pacific region". Bulletin of the Indo-Pacific Prehistory Association. 24 (The Taipei Papers (Volume 2)): 31–50. ^ Simanjuntak, Truman (2006). "Advancement of Research on the Austronesian in Sulawesi". In Simanjuntak, Truman; Hisyam, M.; Prasetyo, Bagyo; Nastiti, Titi Surti. Archaeology: Indonesian Perspective : R.P. Soejono's Festschrift. Indonesian Institute of Sciences (LIPI). pp. 223–231. ISBN 9789792624991. ^ Hasanuddin (2018). "Prehistoric sites in Kabupaten Enrekang, South Sulawesi". In O'Connor, Sue; Bulbeck, David; Meyer, Juliet. The Archaeology of Sulawesi: Current Research on the Pleistocene to the Historic Period. terra australis. 48. ANU Press. pp. 171–189. doi: 10.22459/TA48.11.2018.11. ISBN 9781760462574. ^ Larrue, Sébastien; Meyer, Jean-Yves; Chiron, Thomas (2010). "Anthropogenic Vegetation Contributions to Polynesia's Social Heritage: The Legacy of Candlenut Tree (Aleurites moluccana) Forests and Bamboo (Schizostachyum glaucifolium) Groves on the Island of Tahiti". Economic Botany. 64 (4): 329–339. doi: 10.1007/s12231-010-9130-3. ^ Weisler, Marshall I.; Mendes, Walter P.; Hua, Quan (2015). "A prehistoric quarry/habitation site on Moloka'i and a discussion of an anomalous early date on the Polynesian introduced candlenut (kukui, Aleurites moluccana)". Journal of Pacific Archaeology. 6 (1): 37–57. ^ Kirch, Patrick V. (1989). "Second Millennium B.C. Arboriculture in Melanesia: Archaeological Evidence from the Mussau Islands". Economic Botany. 43 (2): 225–240. ^ Blust, Robert; Trussel, Stephen (2013). "The Austronesian Comparative Dictionary: A Work in Progress". Oceanic Linguistics. 52 (2): 493–523. doi: 10.1353/ol.2013.0016. ^ metscaper (Patrick Gozon) (12 November 2008). "Learning the Trees that Places were Named after". Our Philippine Trees. Retrieved August 16, 2012. ^ Philippine Native Trees 101: Up Close and Personal. Green Convergence for Safe Food, Healthy Environment and Sustainable Economy. 2012-01-01. p. 337. ISBN 9789719546900. ^ Krauss, Beatrice H. (1993). "Chapter 4: Canoes". Plants in Hawaiian Culture. University of Hawaii Press. pp. 50–51. ^ Dunford, Betty; Lilinoe Andrews; Mikiala Ayau; Liana I. Honda; Julie Stewart Williams (2002). Hawaiians of Old (3 ed.). Bess Press. p. 122. ISBN 978-1-57306-137-7. ^ Kepler, Angela Kay (1998). Hawaiian Heritage Plants. University of Hawaii Press. p. 113. ISBN 978-0-8248-1994-1. ^ Elevitch, Craig R.; Harley I. Manner (April 2006). "Aleurites moluccana (kukui)" ( PDF). The Traditional Tree Initiative: 10. 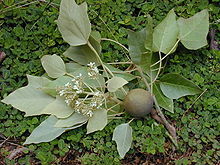 ^ "Candlenut tree: Aboriginal Use of Native Plants". science.uniserve.edu.au. Retrieved 27 July 2016. ^ "Candle Nut". www.sgapqld.org.au. Retrieved 27 July 2016. ^ "Catalogue of Life : Agrianome fairmairei (Montrouzier, 1861)". www.catalogueoflife.org. ^ "Fête du ver de bancoul (Evénements > Thèmes locaux)". www.lafoatourisme.nc. ^ Scott, Susan; Craig Thomas (2000). Poisonous Plants of Paradise: First Aid and Medical Treatment of Injuries from Hawaii's Plants. University of Hawaii Press. p. 26. ISBN 978-0-8248-2251-4. ^ Mower, Nancy Alpert (2001). "Kamapuaʻa: A Hawaiian Trickster". In Jeanne Campbell Reesman. Trickster Lives: Culture and Myth in American Fiction. University of Georgia Press. p. 16. ISBN 978-0-8203-2277-3. Wikimedia Commons has media related to Aleurites moluccanus. Gozun, Patrick. "Our Philippine Trees". "Hawaii Ecosystems at Risk factsheet". "Kukui images". Hawaii Ecosystems at Risk. "Oils of Aloha". [ marketing material?] A Hawaii company producing kukui and macadamia nut products, their website plays host to much information about both nuts. Little Jr., Elbert L.; Skolmen, Roger G. (1989). "Kukui, candlenut-tree" ( PDF). United States Forest Service. Dressler, S.; Schmidt, M. & Zizka, G. (2014). "Aleurites moluccana". African plants – a Photo Guide. Frankfurt/Main: Forschungsinstitut Senckenberg.